There is a growing national consensus, reflected in the positions and priorities of lawmakers at all levels of government, that the U.S. criminal justice system must be reformed with the goal of ending mass incarceration. That consensus extends to upstream preventive strategies, especially for improving approaches to school discipline. The zero-tolerance approach to school discipline leads to approximately three million children being expelled or suspended annually, with a disproportionate number being children of color. This indisputably contributes to increased school dropout rates, juvenile justice system involvement, and ultimately to higher levels of incarceration. A July 22 meeting at the White House to “Rethink School Discipline” reflects this growing consensus. The Obama Administration convened several hundred school leaders from around the country to hear from federal policymakers and share best practices and current research. There were major addresses by the heads of two federal departments—U.S. Education Secretary Arne Duncan set the stage, and Attorney General Loretta Lynch made concluding remarks. But center stage belonged to local school leaders, philanthropists, and academics. “This gives us hope for the most challenged children,” he said. 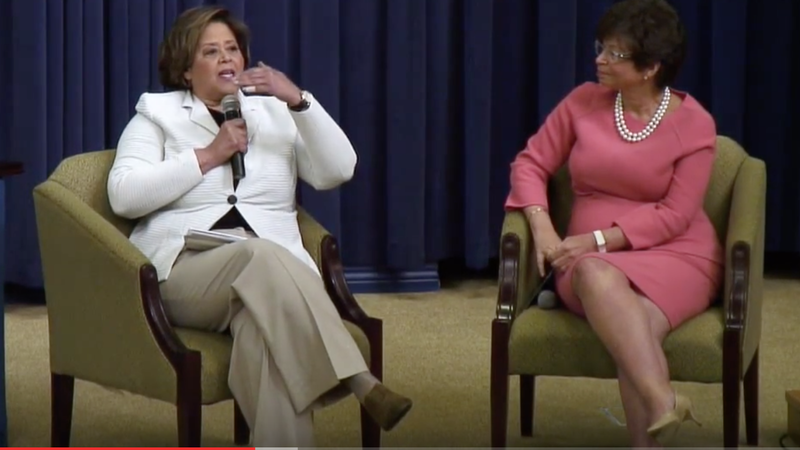 A “Fireside Chat” with presidential advisory Valerie Jarrett and actor Anna Deavere Smith was a highlight. Both Smith and Jarrett were brought up in education-focused households—Smith’s mother was a teacher in Baltimore and Jarrett’s an early childhood education expert and advocate. The conversation included how Smith became involved in the school discipline issue (by being briefed and inspired by officials of The Atlantic Philanthropies and Open Society Foundations) and the history of Barack Obama’s involvement in justice issues. Jarrett said the creation of My Brother’s Keeper is grounded in the President’s belief that all children deserve safe environments where they can reach their full potential. Smith said the stories of children—many from Baltimore—“blew my mind and opened my heart.” She said what is considered “mischief” in white children is pathologized in black, brown, and American Native children. Also, the scope of the issue and its attraction for people in all kinds of disciplines drew Smith in and excited her. The people included the children themselves, judges, principals, teachers and scientists such as Dr. Bruce McEwen of Rockefeller University, whom she described as the grandfather of the term “toxic stress”. Smith envisions a huge institution (she later referred to this as a metaphorical institution) where all kinds of people with different gifts can come together to address these issues. Both Jarrett and Smith emphasized the importance of people getting involved in some way to help those in their communities, not relying solely on government. “We forget how little it takes to change a life—a supportive teacher, a counselor who unleashes the untapped potential of a child,” said Jarrett. They both urged the audience to take back to their communities what they learned at the meeting and help build the momentum behind the movement to improve the lives of all children. Smith includes this call for personal involvement in her play “Notes from the Field: Doing Time in Education,” as described in a recent story on ACEsTooHigh. Cabinet Secretary and chair of My Brother’s Keeper, Broderick Johnson, and University of California, San Francisco, professor Howard Pinderhughes led the session “Addressing Trauma & Community Violence.” Pinderhughes emphasized the importance and depth of trauma, especially in inner-city neighborhoods where there is high level of community and household violence. He asked audience members if they were familiar with the ACE Study and the response prompted him to say “Google it. We should all know about it.” Later he told the audience to “Google” the San Francisco Public Schools program, HEARTS, to learn how it trains teachers and other team members to address trauma. [Here is a story about how the HEARTS program was implemented in El Dorado Elementary School in San Francisco.] He felt that education is often the most difficult partner to get to the table for fear of being labeled a troubled school. He said that it is more important now than ever for schools not to be islands but rather be part of resilience building communities. The panel “Highlighting District Progress” focused on the specific strategies that school districts are using to improve school climate and reduce suspensions and expulsions. They discussed creating a meaningful space for parents to be involved before a crisis occurs, bringing the larger community into a collaboration to address student’s issues, hiring an assistant principal to oversee interventions and supports, and providing a role for the student voice. One specific form of restorative practice was highlighted: a school in New York trains its teachers to facilitate a first period check-in so that students can “unpack” what has happened since the day before. This process allows teachers to know when it is best to ease off some students while pushing others a little harder. Restorative practice is addressed in a First Focus blog along with coverage of other sessions not covered here. A comprehensive listing of resources on these topics was prepared by the Department of Education. School leaders rethink school discipline at White House conference was originally published @ ACEs Too High » Elizabeth Prewitt and has been syndicated with permission.